Practice means to preform over and over again in the face of all obstacles some act of vision, of faith, of desire. 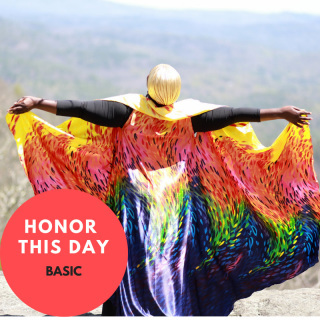 Honor This Day is a vibrant exploration of the myriad ways nature supports us in creating a daily practice that nurtures our souls and our dreams. Nature has a built in support system with the elements of earth, water, air, fire and spirit. Just as nature unfolds it's abundance with regular actions our dreams and goals require the same attention to bloom in our lives. Daily Practices give us a structure to build a relationship with our goals and dreams so we can consciously check on their growth and make adjustments to bring them more fully into being. A teaching on the basic principle of the elements. Honor This Day is a guide to spiritual practice not associated with any particular religion or spiritual path. Though I use words like God/dess, sacred, and spirit, your journey is a sacred path of your own and you are welcome to insert language based upon your own understanding of the sacred. 10 MP3s to download and take the modules with you. A guide reviewing each of the modules with ideas for further exploration of the practices and space to journal your insights. 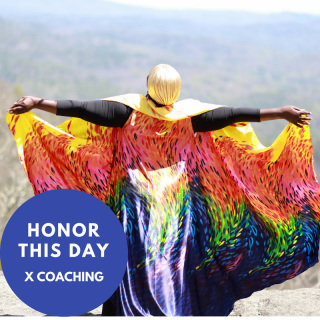 PLUS A bonus guide featuring 11 of my favorite people sharing how they connect with their spirit, dreams and goals everyday to give you more inspiration for your personal practice. One 20 minute Elemental Forces of Creation Oracle Session ($45 value) to be scheduled whenever you need support as you're going through the program or afterward. Oracle Sessions are conducted via Zoom by phone or in person (you can find out more about the Elemental Forces of Creation Oracle Sessions here). A bonus guide featuring 11 of my favorite people sharing how they connect with their spirit, dreams and goals everyday to give you more inspiration for your personal practice. PLUS One 20 minute Elemental Forces of Creation Oracle Session ($45 value) to be scheduled whenever you need support as you're going through the program or afterward. Oracle Sessions are conducted via Zoom or by phone(you can find out more about the Elemental Forces of Creation Oracle Sessions here).